Built in 1927, the Omni Parker House Hotel is a historic hotel in Boston, Massachusetts. 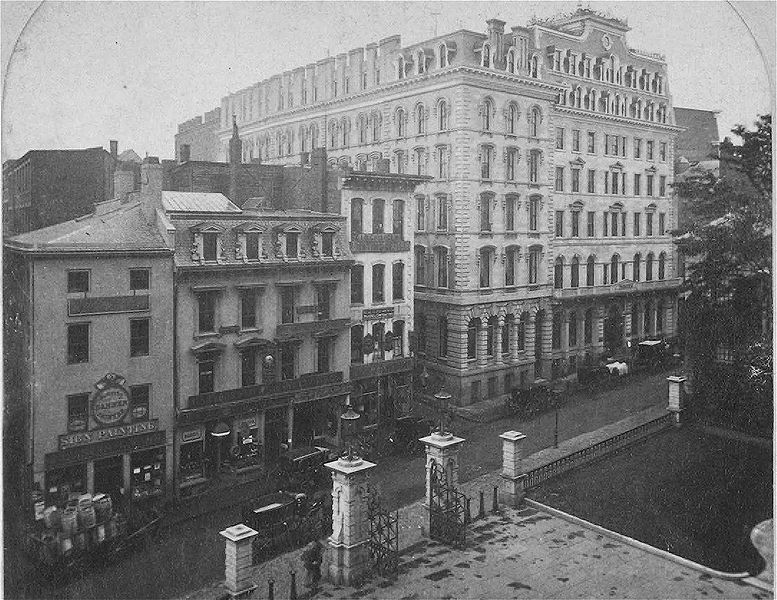 The original Parker House hotel was built in 1855 and a 10-story annex remained open for business while the main building was demolished and rebuilt in the 1920s. Since a working hotel has operated on the spot since 1855, that makes it the longest continuously operating hotels in the U.S. The hotel was founded by Harvey D. Parker, a 20-year-old farm boy from Paris, Maine, who arrived in Boston on a ship in 1825 with less than $1 in his pocket, according to Phyllis Meras in her book The Historic Shops & Restaurants of Boston. 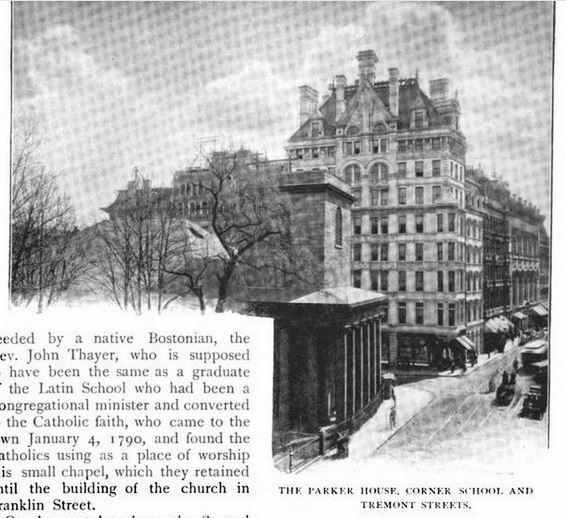 Parker first worked in a stable and also, according Susan Carolyn Wilson in her book Heaven by Hotel Standards:The History of the Omni Parker House, worked for Dr. George Parkman, the doctor who later became the victim of the notoriously grisly Parkman-Webster murder case in 1849. Harvey Parker later became a coachman for a wealthy Watertown woman. Parker would often drive the horse-drawn coach into Boston for his employer and would eat lunch at a small cellar cafe, owned by a man named John E. Hunt, on Court Square. In 1832, Parker bought the cafe for $432 and renamed it Parker’s Restaurant. The cafe became very popular and was known for its excellent food and great service. In 1847, Parker took on a new partner, John F. Mills, and began making plans to build a hotel. On April 22, 1854, Parker purchased the rundown old Mico mansion on the corner of Tremont and School Street and demolished it. The Mico mansion had been built in 1704 for Boston merchant John Mico and was later bequeathed to Mico’s friend Jacob Wendell (the great-grandfather of Oliver Wendell Holmes, Sr.,) in 1718. After Wendell died, Nicholas Boylston, a cousin of John Adams, took possession of the mansion and converted it into a hotel, known as the Boylston Hotel, in 1829. In 1855, the Parker House hotel was finally completed and opened on October 8. The hotel was the first in America to use the “European plan,” meaning guests were only charged for the room and meals were paid for separately. Prior to that, American hotels included meals with the price of the room but they were only available at set times and had limited menus. Parker knew from his earlier restaurant experience that excellent cuisine was an important component of hospitality so he hired the gourmet French chef Sanzian for an annual salary of $5,000, at a time when most cooks earned about $418 a year. In 1856, Sanzian reportedly invented the Boston cream pie that the hotel is now famous for. The pie is a two-layer French butter sponge cake filled with pastry cream and topped with chocolate fondant. The dessert has remained a staple of the hotel’s restaurant ever since. The Boston cream pie became so popular it was later designated the official Massachusetts state dessert in 1996. 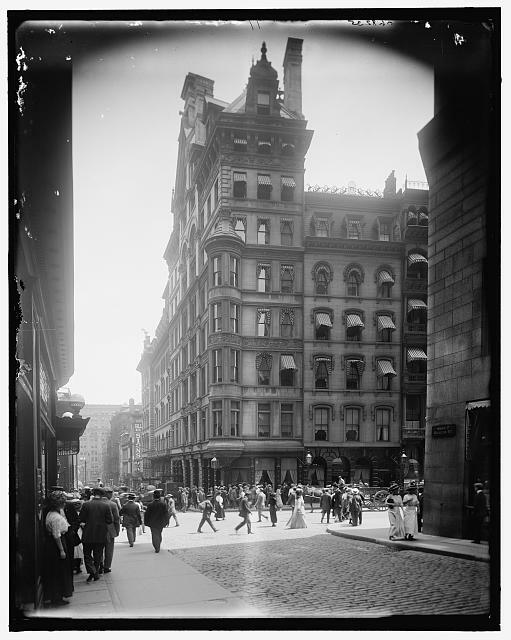 Due to the hotel’s location between the Boston Athenaeum on Beacon Street and the publishing offices of William D. Ticknor and James T. Fields, on the corner of Washington and School Street, the Parker House also became a literary hot spot in Boston. When Charles Dickens stayed at the Parker House during his American lecture tour from 1867-1868, he often joined the Saturday Club’s meetings. Other famous literary guests who visited the hotel around this time includes Mark Twain, Willa Carther and Edith Wharton. In 1860, Parker demolished the Horticultural Hall building next door, on the corner of Chapman Place and School Street, which was the site of the former Boston Latin School from 1748-1844 and still retained the old walls of the school. In its place, Parker built a six-story annex for the hotel. 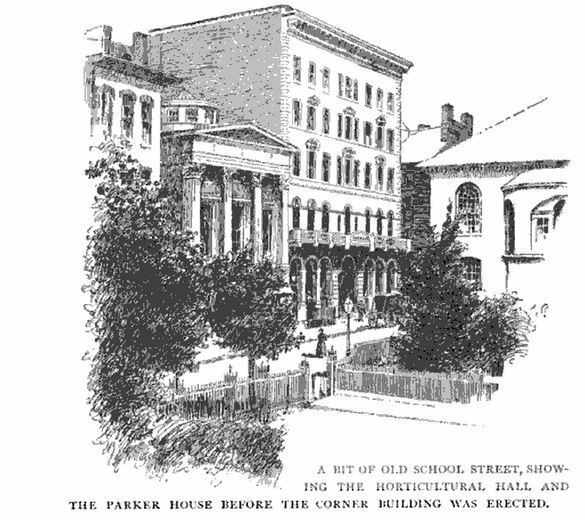 In 1863, Parker acquired the land behind the annex building, on the corner of Chapman Place and Bosworth Street, and built another wing to the Parker House, a 10-story annex. This annex is still in use, making it the oldest part of the hotel, and is reportedly haunted. In 1866, Parker purchased a narrow lot at 66 Tremont street and built a third wing for the hotel, complete with bay windows and a steep Mansford roof, and also added two floors to the main building. In 1865, city officials built a new city hall on School Street and the Parker House suddenly became a meeting place for politicians due to its location between the new city hall and the Massachusetts State House on Beacon Hill. Both state and local politicians often met at the hotel to discuss politics over dinner and drinks. Many notable political guests also stayed at the Parker House during the 1860s, including Mary Todd Lincoln, in November of 1862, while visiting her son Robert who was a student at Harvard. Coincidentally, John Wilkes Booth also stayed at the hotel in the 1860s. Although Booth owned property on Commonwealth Ave, he never built a house on the lot so he often stayed at the Parker House when he was in town. In July of 1864, Booth reportedly met with either Confederate secret agents or Confederate sympathizers at the Parker House hotel to hatch a plan to kidnap President Lincoln. Booth’s kidnapping plan fell through but he later stayed at the hotel again on April 5 and 6 in 1865, just 10 days before he assassinated the president. During Booth’s last visit to the hotel, an eyewitnesses said he saw Booth practicing his pistol shooting at a nearby shooting gallery, presumably Roland Edwards’ Pistol Gallery on Green Street. Sometime in the 1870s, the now famous Parker House rolls were invented. The rolls are a soft, folded bread roll with a crispy shell. Legend has it the rolls were invented when a disgruntled German baker named Ward threw a batch of unfinished rolls into the oven after an altercation with a hotel guest. When the rolls came out of the oven, they had a folded shape that made them light and fluffy on the inside but with a crispy, buttery shell on the outside. The rolls became so popular that through the 19th and 20th century, they were packaged and shipped from the kitchen to hotels, restaurants and stores across the country. On May 31, 1884, Harvey Parker died at the age of 79 and was buried in Mount Auburn Cemetery in Cambridge. At the time of his death, Parker had a net worth of a little over $1 million dollars. Since Parker’s two sons had died before him, the hotel passed to his business partners Edward O. Punchard and Joseph Beckman. After Parker’s death, Punchard and Beckman decided to complete Parker’s dream to expand the hotel by adding yet another extension to the main building. The extension was an elaborate, narrow, eight story-structure on the corner of Tremont and School streets, land which Parker had purchased in 1883. The addition was designed by architect Gridley James Fox Bryant and featured a marble-facade, a pavilion roof, and an iron balustrade. In 1891, Joseph Reed Whipple, who had worked with Parker’s first partner, John F. Mills, took over management of the hotel, which he ran until his death in 1912. During the early part of the 20th century, a number of now famous political leaders and activists worked in the hotel’s restaurant. From 1912 to 1913, Ho Chi Minh, the Vietnamese Communist revolutionary leader, worked as a cook’s helper in the basement pastry kitchen. Although hotel management and U.S. immigration officials have been unable to find any records of Minh’s employment at the hotel, Minh himself reportedly sent a letter, dated December 15, 1912, from Boston to Phan Chu Trinh in France stating that he had been working as a cook’s helper at the Parker House in Boston. Minh had left French Indochina in 1911 to travel and find employment. He worked as a kitchen helper on a French steam ship that made several stops on the East Coast of the United States, including New York City and Boston, where he decided to leave the ship and seek employment. In 2005, a Vietnamese delegation that included Prime Minister Phan Van Khai and Truong Quang Duoc, Vice President of the National Assembly, also visited the Omni Parker House to view the hotel and the Ho Chi Minh table in the pastry kitchen. Coincidentally, a few decades later, yet another famous activist and political leader worked at the hotel when Malcolm Little, later known as the civil rights activist Malcolm X, worked as a bus boy at the hotel’s restaurant in the 1940s. Another famous person who once worked at the restaurant was celebrity chef Emeril Lagasse who served as the Sous Chef in the Parker kitchens from 1979 to 1981. In 1925, the Whipple Cooperation bought the Parker House from the Trustees of the Parker Estate and, on November 23, they closed the Parker House down in preparation for demolition in December, although the 80-room, 10-story annex on the corner of Chapman Place and Bosworth Street, remained open to guests. Since the annex building remained open during the demolition of the main building, it has allowed the hotel to be described as the oldest “continuously operating” hotel in the country. The old Parker House was demolished and replaced with a new 14-story building, made from polished black Quincy granite on the lower exterior facades and limestone and buff-colored brick above. The new building, designed by architect G. Henri Desmond of Desmond & Lord Architects, was fireproof and featured oak paneling, plastered ceilings, crystal chandeliers, bronze-detailed doors and 800 guest rooms. The Parker House reopened on May 12, 1927. To celebrate the hotel’s rebirth, the general manager Claude M. Hart,and his secretary, Alice Mulligan, flew over Boston harbor in a private plane where Mulligan ceremoniously threw the keys to the old Parker House building into the water below. The celebration didn’t last long though because the financial crash of 1929 and the Great Depression that followed later put the the Parker House in financial trouble, as it did to most hotels in the country. In 1933, the Atlantic National Bank foreclosed on the Parker House hotel’s mortgage. Then the First National Bank acquired the Atlantic National Bank along with its mortgage of the Parker House. In February of 1933, Glenwood Sherrard purchased the Parker House, and the old 10-story annex behind it, for $3,300,000. Sherrard took over management of the hotel and revived the struggling business. He continued to run the Parker House until his death in 1958. During the 10 years that followed though, the Parker House fell on hard times again. Sherrard’s son, Andrew, managed the hotel but was known to make bad business decisions. 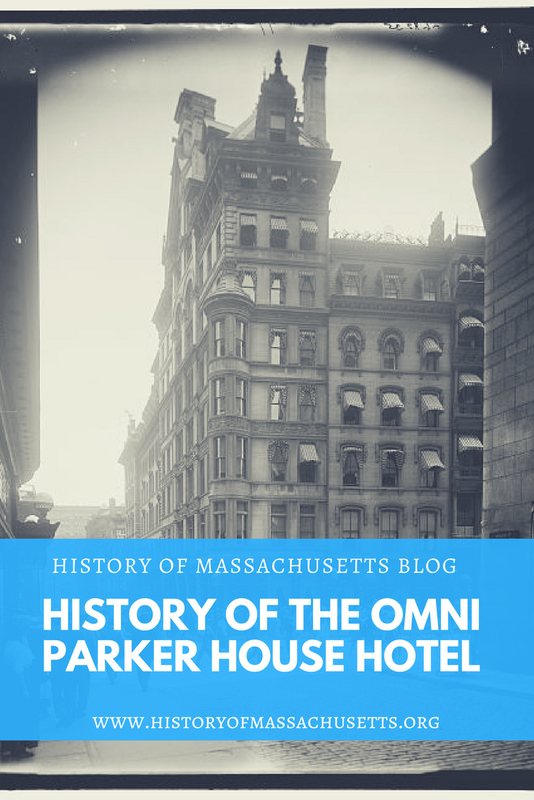 In 1980, Dunfey Hotels bought the rights to Omni International Hotels name and in 1996, the Parker House name was changed to the Omni Parker House hotel. In 2008, the hotel underwent a $30 million dollar renovation and the rooms were restructured into 530 guestrooms and 21 deluxe suites. Bross, Tom and Patricia Harris, David Lyon. DK Eyewitness Travel Guide: Boston. Dorling Kindersley Limited, 2001. Turkel, Stanley. Built to Last: 100 + Year-Old Hotels East of the Mississippi. Author House, LLC, 2013. Bauer, Steve and Linda. Recipes from Historic New England: A Restaurant Guide and Cookbook. Taylor Trade Publishing, 2009. Hope you have a great stay at the Parker House!